Our Wrangler was purchased new in early 2019 to replace our Dart as the cold weather commuter and to also serve as the towing / hauling replacement for our aging Dodge Dakota. To that end, modifications will focus on a balance between trail capability and street manners, along with power and durability. 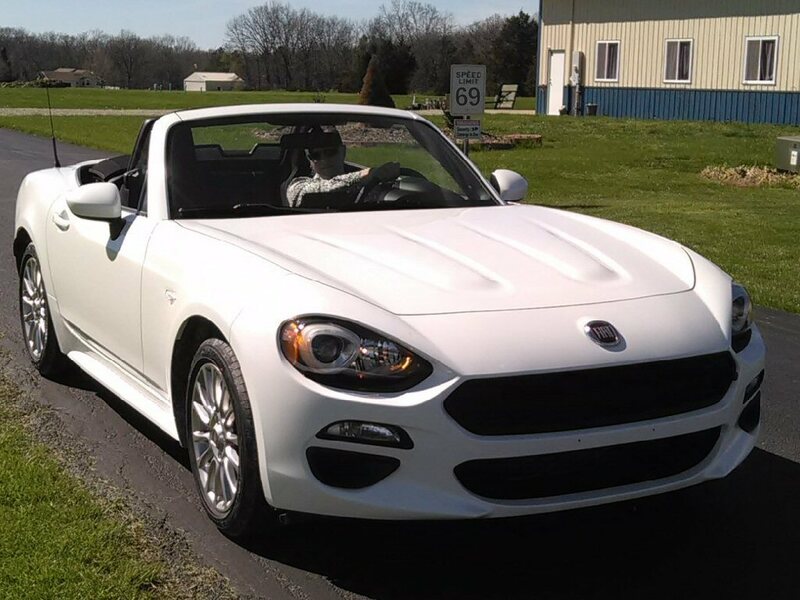 Our Fiat 124 Spider was purchased new in spring of 2017 to be our fair weather commuter and new racing flagship. The 124 will be street driven while R&D is being performed and mods are being made that are mild enough to keep it streetable. Once we have a fun and fast autocross car, Mamba will be taken off the street and made race-only, and given no-holds-barred treatment with no frills and absolute thrills in mind! Our Dodge Dakota serves us where a car just can't, with its Magnum v6 engine and 6.5' bed. Whether shipping orders or picking up parts and supplies, it's just so handy to have around. This Dakota was purchased used and with nearly a quarter million miles on it, so the plan for it is mostly maintenance, with modifications kept mild and practial, with a focus on utility and durability. Taking the fun off the beaten path, the Ranger is our first foray into the UTV market. While this is our first off-road project, it is our third electric vehicle. Frogger is a fully electric 4-wheel drive side-by-side. In 4WD mode, it's virtually unstoppable, and with turf mode, has impressive range for driving around town. Our primary use for the Ranger is farm/home type chores, pulling a trailmower, or even a project vehicle around on the property when necessary. Mods to the Ranger are focused on off-road capability and practial utility. 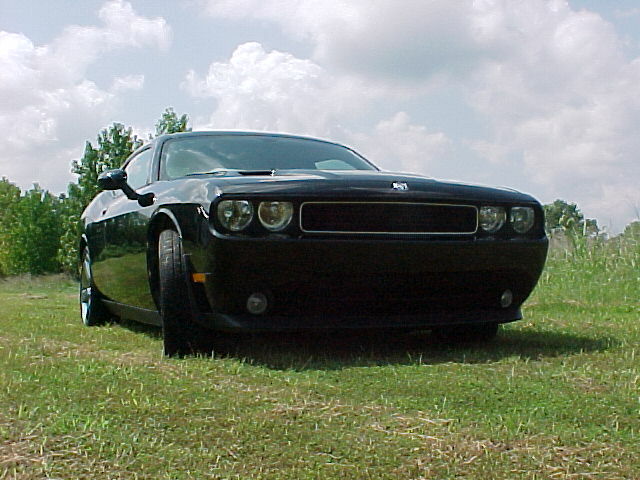 Our 2009 Challenger R/T was purchased to be our new "modern muscle", a Dodge Ram Truck in disguise. With its 5.7L HEMI v8 and automatic and seating for 5, it's both powerful and practical. The primary role for the Challenger is to be a weekend cruiser and summer fun car, and modifications are minimal and tasteful, with a focus on capability and long-term durability. 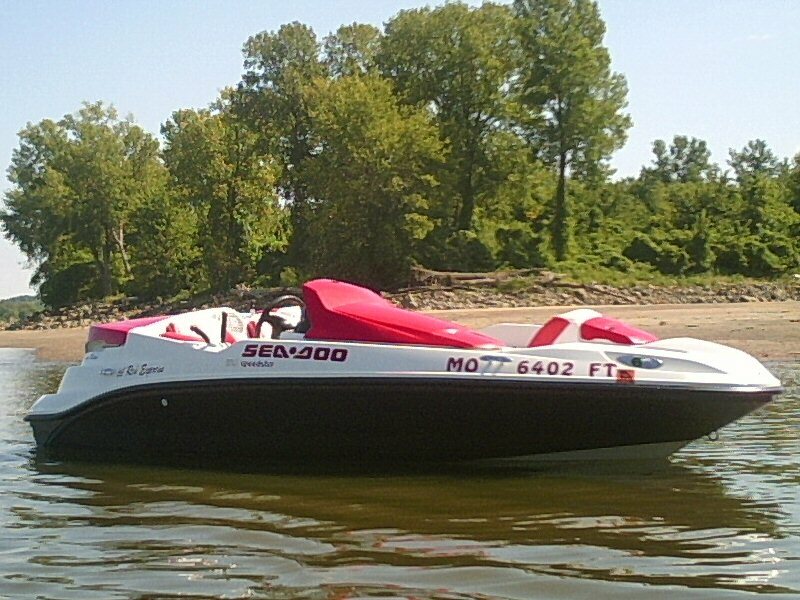 Our Sea Doo jet boat is our sports car on water! It has a 1.4L supercharged 3-cylinder and jet propulsion for amazing speed and maneuverability, and reasonably good fuel economy when cruising. The Speedster is actually our second watercraft project, and was purchased during the time when we reduced company operations to brief production runs for individual projects. The primary purpose Lil Red is summer family fun, and it does its job well. Our second in a trio of motorcycle projects, Silver is designed to be the most economical gas-powered transport possible. A light curb weight and small engine start us off on the right foot, and the cruiser bike styling makes it fun and comfortable to ride. Mods are centered around weight reduction and maximum MPG, while keeping the bike highway-capable. Our Dodge Dart Rallye, with Citrus Peel exterior, 1.4L i4 turbo and 6spd manual. 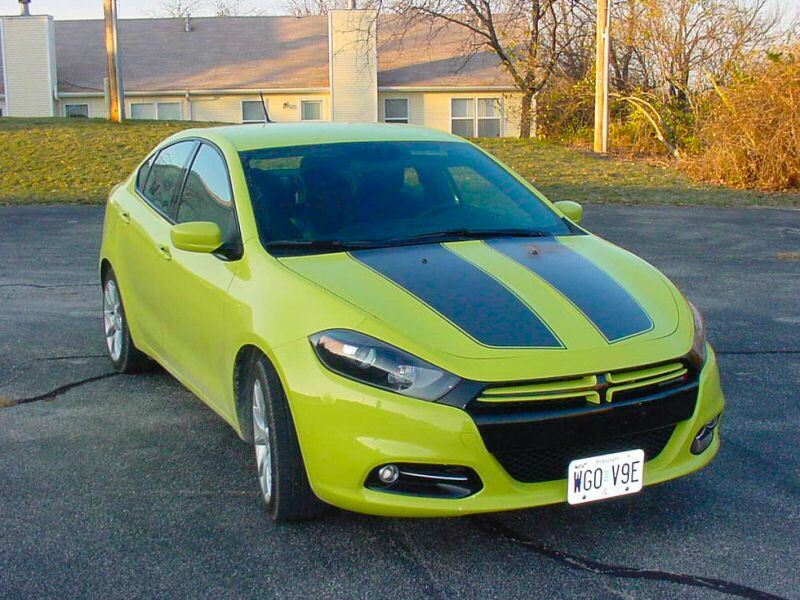 The Dart was purchased new in late 2012, to be the replacement for our Neons as our small car platform flagship. Its first role was as a daily driver, and eventually saw numerous mods regarding appearance, performance, and durability. The Dart was also our primary product R&D focus during this period, since parts developed for the FCA PF chassis directly fit or lead to the Jeep Renegade and Cherokee, FIAT 500X, and Chrysler 200. FCA ended production of the Dart in 2016, so we made the decision to focus our racing development effots on the new Fiat 124 Spider, which starts out with the same 1.4l i4 turbo, but with rear wheel drive and a much lower curb weight. The Dart was sold in early 2019 with 116,000 miles and still running great, and we plan on supporting the Dart aftermarket for quite some time. Seeing Chrysler's rising success in SCCA Club Racing, we took a serious interest in this little subcompact. Practical, fun, sporty, and fast, the Neon was the perfect car to start our new hobby. Over the years, this husband-and-wife hobby turned into a family business, with this Neon at the center. From 1996 through 2013, Venom was our flagship car, and many parts were prototyped on this vehicle. Venom was never the same car for two races, as something was always getting added or changed. The Neon earned us a wall-full of trophies over the years, and the modifications are almost too numerous to mention. We sold Venom, still running great, after acquiring our new flagship, a 2013 Dodge Dart. Ole Red was purchased early in 2012 as we began to bring Deyeme Racing out of the hibernation it had been in since '07, while the economic crisis was underway. Since a 1st gen. Neon was our first project, we needed one that didn't have a single DMR brand part on it, so we could truly start from scratch. We went to work, quickly swapping in our drivetrain mounts, lightweight brackets, and numerous other items, with a focus on MPG and reliability, since this was to be a daily driver. With demand for Neon parts waning, and Chrysler's new compact on the horizon, we decided to sell this Neon to make room for a new Dart. Named for the mythical god of Thunder, our 1995 Dodge Dakota was acquired specifically to convert to electric. Our second EV project, this was our first one started from scratch. Thor started out in our ownership with a tired 2.5L i4 engine, and when we were done, had a refreshed body and an electric motor with 144v of motivation. Thor was highway capable and had a range of nearly 50 miles, yet was still fully practical as a pickup truck. Thor was built as an educational product during the time when Deyeme Racing was doing only limited-edition run projects. New items were created for this project, such as the motor/flywheel coupler and tilt bed, and existing items were used for inspiration, like our engine/trans dust shield (first developed for the Neon) and hood latch bracket (first developed for the Spirit). Seaweed, our '00 Dodge Durango, was purchased to replace the Ram Van, as tow vehicle for race, show, and boating. While the Durango had less interior room than the van, it did have the same size engine (5.9L v8) and four wheel drive, making it a truly useful utility vehicle. Mods were kept tasteful and "under the skin", such as an improved ignition and exhaust. With Deyeme Racing running at a minimal capacity around 2009, we decided to sell the Durango and focus on individual limited-edition run projects. Project Phantom was our first turbo project vehicle. A rare find from a Ford dealership, the Spirit was experiencing a boost leak, but otherwise running well. Phantom's main job was to expand our product line, just as we were doing with the Stratus Coupe. The turbo Dodge community was still very active, and items like those we already produced were right at home in a FWD turbo package. Phantom was powered with a 2.5L non-intercooled turbo and automatic transaxle. Subtle and understated, this "grandma car" made quite the fun and capable daily driver. Mods included a short radiator and Daytona intercooler, trans cooler, upgraded turbo, and many of our own items. The Spirit was finally sold in 2012, as turbo Dodge product demand waned. Juice, our 2008 Ninja 650R, was our third motorcycle project, purchased used in late 2010, trading in our first bike, Dusk. With miles and experience behind us, it was time for something with a little more performance, but still practical as a 3-season daily driver. Taking what we learned from the 250R project, we quickly designed many of the same parts, like our windscreen extension. Mods to this bike also included new front and rear sprockets, bigger front fender, lowering brackets, and other mods to enhance performance and economy. As with Dusk, we made many of the items we produced for Juice available as limited-edition items. The bike was sold in 2012 in preperation for adding a new Dodge Dart to the garage. Looking to expand our capability from the track to the beach, we purchased a 2005 Kawasaki Jet Ski runabout. Lynn Dawn was powered by a 1.4L i4 engine, with a direct-driven jet pushing nearly 960lb of thrust! The Jet Ski's purpose was to take our name to the water, and mods were kept light, with an emphasis on getting attention, such as a marine stereo and twin isolated battery setup with solar trickle charger. As our family grew, we sold the Jet Ski to make room for a jet boat in 2011. Dusk, our 2009 Ninja 250R, was our first 2-wheel project, purchased new in the spring of 2009. Incredibly fun to ride, its primary purpose was to save gas as a 3-season daily driver while getting a new engineering perspective and new ideas for future projects and custom products. Dusk's modifications included "big brother" front fender (ZX14) and muffler (ZX6R), along with a custom power outlet, windscreen extension, airdam, vertical tag bracket, and numerous other goodies. Many of these items were made available as limited production items. Dusk was traded in, still in excellent shape and with almost 12,000 miles on the clock, for a Ninja 650R, our third motorcycle. Abyss was our official tow vehicle from 2004 through 2008. First in our possession as a tired old gutted conversion van, we made numerous upgrades with the ignition, exhaust, and other "engine externals", making it a reliable and roomy vehicle for towing our race car and watercraft. It was powered by a 5.9L (360) v8 engine, and had numberous options, including power windows and locks! The van was sold in running condition when we found a 2000 Durango to replace it. As carmakers were dragging their feet with developing a true EV (electric vehicle), we began research into doing a gas-to-electric conversion. During our search, we found Evie, an '02 PT Cruiser that had been converted to electric by a hobbyist. While Evie fell short in some ways, it did make a good starting point. After a lot of learning and some improvements, we sold Evie and began looking for a pickup truck for a longer-range and more capable EV conversion we could start from scratch. With Project Venom serving as a full-time race car and no longer being street driven, we purchased a new 2002 Dodge Stratus Coupe to serve as our new street / show car. Modded for durability and appearance, and kept street-friendly, Project Avenger took us to the car shows the way the Neon was taking us to the track, and allowed us to expand our product line to the Diamond-Star (Avenger, Talon, Eclipse, Sebring, et al) crowd. Show mods included Eclispe doors, anodized headlamp reflectors, and lots of aluminum and titanium throughout. Project Avenger was replaced with Celeste, our third Neon project. Oscar, our 1996 Grand Voyager, was purchased used as both a family hauler and occasional tow vehicle, as the mods to Venom, our '96 Neon ACR, were getting more extreme, and we were frequenting races further from home base. Modifications to the Voyager were mostly maintenance-related, however we did convert the van to E85 capable and installed a cold-air intake with (functional!) hood scoop for the extra power needed for towing a 2000lb race car and gear. After years of reliable service, we sold Oscar to purchase two vehicles- a smaller daily driver (Dodge Spirit), and an even more capable tow vehicle (Ram Van).